DUESSELDORF, Germany (AP) — Germany goalkeeper Manuel Neuer faces another spell on the sidelines after going off injured in Bayern Munich’s 4-1 Bundesliga win at Fortuna Duesseldorf on Sunday. 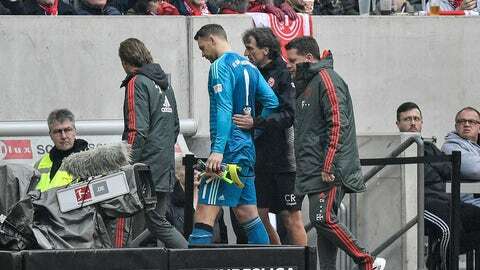 Neuer injured his calf with no other players seemingly involved and limped off for Bayern replacement goalkeeper Sven Ulreich in the 53rd minute. Neuer has missed two games already in the second half of the season due to a thumb injury and left calf problem. The 33-year-old made only three league appearances for Bayern last season due to a hairline fracture in his left foot. Still, Neuer retained his place for Germany as the defending champion exited the World Cup at the group stage last year. Mats Hummels also limped off after the win in Duesseldorf. The Bayern defender appeared to have a hamstring injury.